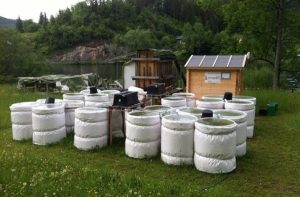 Approved TA-users are invited to participate during mesocosm experiment scheduled 1st June – 31th July 2019 (the schedule is open for adjustments, depending on applications). We open TA for up to 150 person days that are for 2-3 groups. Our facilities consist of 40 land-based mesocosms with 320 L each. Functional diversity of phytoplankton and mixotrophy: Our lab has a special interest in mixotrophy and its implications for the pelagic microbial food web. Mixotrophic protists have been identified as key bacterivores in lakes (and oceans), especially in oligotrophic systems, such as Lake Lunz. The apparent prevalence of mixotrophic protists in the field contrasts our current understanding about their impact on microbial food web dynamics and carbon and nutrient cycles. Moreover, changes to aquatic environments due to global climate change, such as rising water temperatures and increasing input of terrigenous dissolved organic carbon, are likely to promote the growth of mixotrophic plankton. 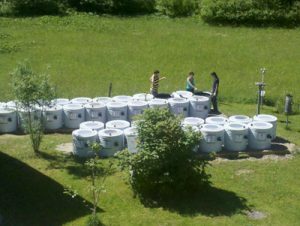 Our 24 heatable mesocosms (400 L each) are open for use from January 1 – December 31, 2019. Jun 1 – Aug 31, 2019. JOMEX experiment (linked to JRA in AQUACOSM WP9): Effects of climate change on contaminants in the planktonic food web: assessing the role of temperature and DOM on mercury (THg and MeHg) allocation in 24 land-based mesocosms. Project lead: Martin Kainz. We open TA for up to 150 person days that are for 2-3 groups. Plankton response to toxic exposure: we are interested in the effects of heavy metals, mercury in particular, and Microplastics on bioaccumulation dynamics and plankton life history traits. We plan to conduct experiments at different carbon levels (‘browning’) and water temperatures to simulate contamination effects under different climate change scenarios. Before/after this period the facility can be made available for experiments suggested by users. No opening for TA planned in 2019. We intend to open TA for up to 150 person days that are for 2-3 groups, if the actual proposal is funded. People/Number/Type: Needed to prepare: 5-7 people for 1-2 weeks; to run only 2 people needed. Cleanup needs 5-7 people for one week again. Years/Time/Season: Experiments possible during frost-free season; May to October. Common duration shall be a minimum of 4-6 weeks, as biofilm needs 2-3 weeks to mature, depending on the question. The Lunz Mesocosm Infrastructure (LMI) at WCL hosts for our 4 mesocosm facilities, two tank systems 1A Ptacnik mesocosms and 1B Kainz mesocosms, and two flumes 2A BOKU flumes, 2B Schelker flumes. In 2018, we open for AQUACOSM Transnational Access (TA) for selected users to facilities 1A, 1B B and 2B. 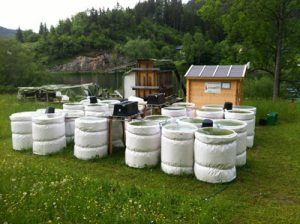 Users are invited to participate during mesocosm experiment scheduled 1st June – 30th August 2018. We open TA for 210 person days that are for 2-3 groups. The experiment will address the role of connectivity for diversity and functioning of plankton communities. 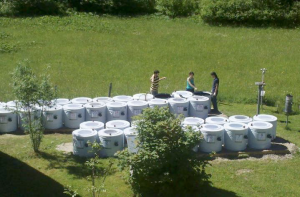 We will manipulate connectivity of mesocosms to natural habitats (lakes in the area). Further details can be found on the Aquascale lab webpage. We encourage researchers to participate by contributing in analysis of functional aspects of plankton food web ecology (microbial loop; role of MZP) as well as experts in analysis of molecular analysis. This facility is available for TA from Jan 1st-Dec 31st, for up to two months and up to 210 person-days – e.g. 10 people for 10 days. No specific experiment is planned yet. Manipulation of temperature and/or DOC, nutrients etc. are possible. Please contact Martin Kainz for possible collaborations. 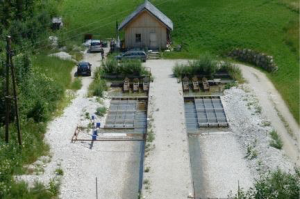 Users who are selected for TA are invited to join the Flume experiment on stream microbial inoculation within the ÖAW project Hydro-Diversity planned to run from the beginning of June to mid of August 2018. In addition, open slots for TA users are September to End of October. Minimum required stay for users is one month, so this could be two time slots, but is most likely just one slot that is realistic (210 person-days). No TA opening planned in 2018. 1) Please login or register to view contact information.2) Please login or register to view contact information., Please login or register to view contact information. consists of two large channels (40 m length, 6 m width) fed with nutrient-poor lake water taken at different depths to vary water temperature. Peak flows of up to 600 l/s are produced to mimic hydropeaking, thermopeaking or extreme floods. 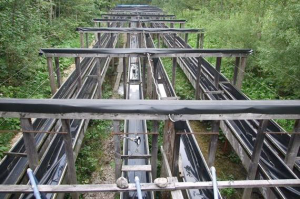 The EcoCatch flumes, also named the ‘Lunzer Rinnen’ consist of 6 streamside experimental flumes of 40m length in which replicated streams can be simulated. The flumes can be used in two operational modes, in flow-through mode with raw stream water to all flumes, or in recirculation mode, with separate recirculation for each flume. A fact-sheet can be found here. Discharge (0 to ~7,5 L/s per flume), flow velocity, water level, slope, bed structure/ sediment composition, biofilm age (often co-variable), light/shading, nutrient status, additions of nutrients, DOM, soil etc. possible. Potentially water temperature can also be modified. 2B) EcoCatch Flumes, view from the header tank before adding sediment for an experiment. Twoexperimental river flumes referred to as the Hydromorphological and Temperature Experimental Channels (HyTEC) and the EcoCatch Flumes(Fig. 6.10.2). HyTEC consists of two large channels (40 m length, 6 m width) that can each be subdivided into up to 4 small flumes fed with nutrient-poor lake water. Peak flows of up to 600 l/s can be generated to mimic events such hydro- or thermopeaking or extreme floods. 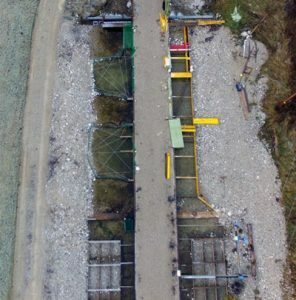 The EcoCatch Flumes consist of 6 streamside channels (40 m long, 0.4 m wide) that are continuously fed with stream water. Basic hydraulic and sediment characteristics can be adjusted and solutes such as inorganic nutrients or DOM be added. Available infrastructure and instruments beyond the mesocosm facilities include 3 boats and 2 cars; several standard labs, a radio-isotope lab (3H, 14C); walk-in environmental chambers; an elemental analyser coupled to an isotope-ratio mass spectrometer (IRMS); GC-FID/MS for analysing fatty acids, HPLC for pigment and amino acid analysis, flow cytometer to analyse small phyto- and bacterioplankton, total organic carbon (TOC) analyser, autoanalyser for nutrients analyses; bench spectrophotometer and fluorometer; PhytoPAM fluorometer; and dissecting, bright-field, inverted and epifluorescence microscopes. Field gear and instrumentation is also available. This includes various standard sampling gear, nets of various mesh sizes to fractionate plankton, water collection tubes. temperature sensors. 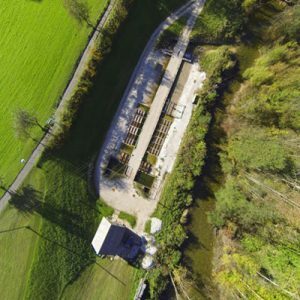 Equipment and gear used in the HyTEC river flumes include a fully automated discharge and water-temperature interface, data loggers, a flow velocity measurement systems, a remote-controlled (IR) video system, electrofishing devices, sampling gear, tanks for hatching and maintaining fish, etc. Fully automated discharge and water temperature interface, datalogger, flow velocity measurement systems, remote-controlled (IR-) video system, electrofishing devices, sampling gears, several tanks for fish hatchery, etc. Measurements of temperature, light and O2 dynamics etc. in-situ. Instrumentation includes a system so measure full high frequency (1h values) DOC, NO3, COD, Turbidity etc. from DOM absorbance spectra (Scan:::Spectrolyser probe), for all 6 flumes plus the inlet. Other in-situ probes can be added. Tiles can be added for biofilm study. Small Hut for sample preparation. Lab analysis at WCL. A total of at least 1040 person-days will be allocated to external users through AQUACOSM Transnational Access provision in years 2-4. Access to a minimum of 8 persons is offered for 40 person-days. The partly temperature-controlled mesocosms will be accessible year round during reserved time slots. Further details about Transnational Access provision at all facilities are described in WP1. Additional charges may apply to special services such as stable-isotope or HPLC analyses. Services currently offered by the infrastructure: Users will have access to mesocosms office and lab space and the equipment described above. Modern guest rooms for up to 20 users are available. Ample additional lodging options exist in Lunz. Additional facilities and instruments can be made available at the universities in Vienna (2 h drive). 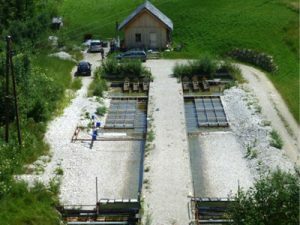 Users of LMI will benefit from exceptional scientific experience of the local staff with aquatic mesocosm experiments, long-term data on Lake Lunz and the local streams (Lunzer Seebach), and expertise in freshwater biodiversity, aquatic ecology and biogeochemistry of the academic and technical WCL staff, which has pursued a highly active and international research programme of over the past 20 years. Support offered under AQUACOSM: Users will have access to office and lab space, dormitories and other lodging facilities as well as equipment available at the WCL. Cooperation with local scientists is encouraged to take full advantage of their expertise and access to analytical instruments. Technical assistants at WCL will train all users prior to and during their research activities. Coordination meetings before each experiment will optimize the scientific outcome of all activities.